Many of us may have received a "Christmas Cactus" as a holiday gift or purchased one for ourselves. You may also have experienced the blossoms dropping soon after you placed it on display in your home. Rest assured that the latter, while unfortunate, does not mean that there is anything wrong with the plant. We'll get to the issue of blossom drop later but first we'll get a little background on the Christmas cactus. Despite its name, it is not a cactus as most gardeners think of a cactus. The plant is a native of the Brazilian rainforest. It is of the genus Schlumbergera so named for a French plant collector. They are considered epiphytes in their native habitat, an organism that grows on a living plant. These plants grow on tree branches where water drains off quickly so the plants, despite the heavy rainfall, grow in dry conditions most of the time. Another way that these plants differ from traditional cacti is that instead of being heat tolerant, they will keep their blossoms longer in cooler temperatures. Keeping the plant in a well lit location away from heat sources and drafts will help to keep the plant from dropping its flower buds. There are several different popular varieties of this plant. Christmas cacti have scalloped segments, Easter cacti have rounded teeth along the edges and Thanksgiving cacti have pointed teeth. These different varieties are often lumped together and called Christmas cactus. In any case, the stems of the plants are made up of these pads, similar to leaves that are joined end to end. The flowers of the species are considered diurnal, meaning they close at night.Christmas cactus, being a tropical plant, isn't as drought tolerant as it's desert cousins either. The plant will wilt and may drop its flower buds if the soil becomes too dry. The plant should be watered thoroughly when the top inch of soil becomes dry. Time between watering will depend on the environment it is growing in. If your plant wilts or dries out frequently, it may be necessary to re-pot it. Choose a slightly larger pot, unglazed tend to work better. Remove the plant from its old pot and score the roots. Use a potting mix that is designed for succulents or use a mixture of 2/3 regular potting mix and 1/3 sand, vermiculite or perlite. While the plant is growing between blooming, the use of a houseplant fertilizer that encourages blooming according to the package instructions will take care of the plant's nutrient needs. Also after blooming, prune the plant by pinching or cutting off a few segments on each stem. The cuttings can be easily rooted in moist sand or vermiculite and new plants will be yours in a couple of weeks. Be sure to place the narrower end that was closest to the plant base in the soil about 1/3 the height of the segment. Rooting hormone, while not necessary, will help encourage new root growth. 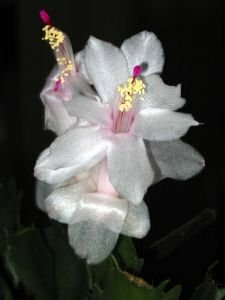 Christmas cactus can adapt itself to low light conditions, but the most blooms are produced on plants that have been kept in sunny indoor locations. The plants can also be moved to the outdoors once all danger of frost has past. They do best outdoors in shade to partial shade. Too much outdoor sunlight can cause the foliage to take on a reddish tinge and may even damage the leaves. In the fall, re-adjust the plants to the indoors slowly by bringing them inside each day for increasing periods of time. To get your plant to bloom again, it will need to be kept in total darkness for 12 hours each day starting in mid September to October. Moving them to a closet or using a box to cover them completely should be done for six to eight weeks until buds start to form. The same effect can be had by keeping the plants in 50-55 degree temperatures for the same time period, but the 12 hours of darkness is easier for the home gardener to achieve. This is a versatile, easy to care for and hardy plant that will last generations when properly cared for. For more information, Ron Smith, a Horticulturist at the North Dakota State University Extension Service has a great Q&A web page on these fascinating plants.